Situated on Beautiful Lake Lure in the North Carolina Mountains, this Non-Smoking home is only 25 minutes from Asheville, North Carolina, home of the Biltmore Estate. Lake Lure is noted as the filming location for the films 'Dirty Dancing' and 'Last of the Mohicans'. Our newly renovated home is decorated in rustic mountain decor and is 'beary' appealing. The sunroom overlooks the lake and cove and is a perfect place to relax in one of the rocking chairs or rustic log chairs. Equipped with a bar area, it is the perfect place to take in the Lure of the Lake. Our home has a main floor with two bedrooms, full kitchen, den, full bath, woodburning fireplace, small bar area and sunroom which views the beautiful lake. One of the bedrooms has a queen bed and the other has twin bunk beds. The newly tiled downstairs portion of the house is accessed from interior stairs and is furnished with a King Size Bed, sleeper sofa and love seat. There is a new flatscreen TV and VCR for your enjoyment. The washer and dryer are located in this portion of the house and there is a newly renovated full bathroom downstairs. There are several Televisions provided upstairs and downstairs with cable. 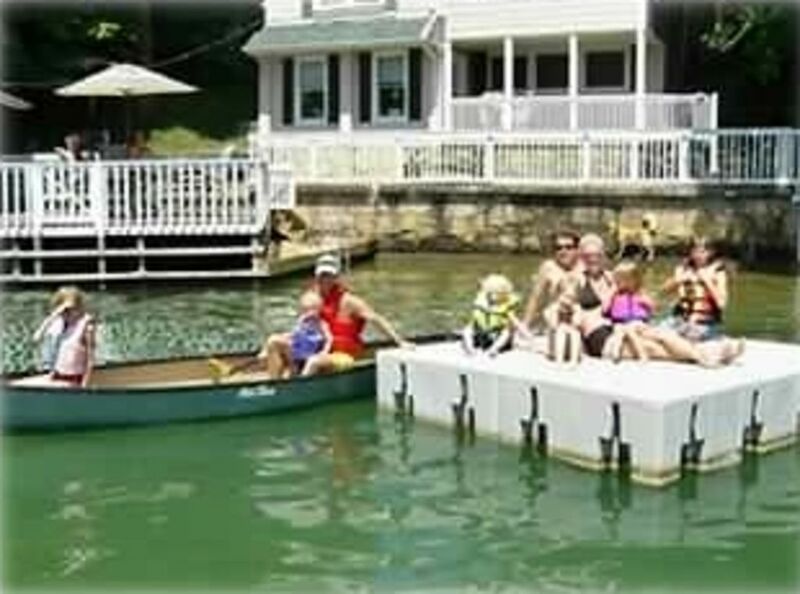 There is an 8' x 8' floating dock for swimming, jumping or relaxing out in the lake. Additionally, fixed platforms have been modified at the lake level for better enjoyment of the lake and easier docking of guests boats. Our home is equipped with a completely fenced yard and fenced deck on the lake and has a concrete patio with steps into the water with a lakefront setting that's second to none. Parking is limited to three cars along Charlotte Drive and the front door is only a few steps away. Come enjoy your stay on this picturesque lake and see why Lake Lure is a diamond in the rough. Please note that our home is located in an area where there are year round residents. Please be courteous during your stay. We are limited to 3 parking spaces at a maximum. If you happen to bring a boat trailer, this will count as 1 of the parking spaces. Additional cars will need to find another location to park. Thank you. Our home was total renovated during the winter of 2012 and has a brand new fully equipped kitchen, flat screen tv's and several new couches, chairs and tables. We loved staying at the cabin. It was super clean and so convenient to the water. Fabulous for families coming with small children or pets since it was fenced in. The kitchen is recently renovated and well-equipped. Beds are very comfortable and the master downstairs was spacious. Access to the water from multiple points made getting paddle boards, a kayak and swimming very easy. Big water views from the upstairs of the house are fabulous and make this a wonderful place to stay! We are glad you enjoyed your stay and hope you return in the future. This was our second time here and WOW have they made a lot of improvements! Gorgeous new kitchen and bathrooms made our visit even better than before. Perfect quiet spot on the lake with beautiful surroundings. The owners make sure you have everything you need for a comfortable stay and keep everything clean and inviting. Can't wait to come back! The lakeside location is very good. The owner responded quickly for requests for replacement of housewares and deck items. I don't like giving negative reviews, but I rely on realistic reports from previous renters when I consider a potential rental online. The interior pictures were correct, but the depiction of the outdoor deck(s) are out of date and do not reflect the fact that deck and rails have not been maintained and painted in a long while. There is also a drainage issue on the lower level, with a peculiar odor from the sump drain in the laundry area that needs to be addressed in some manner other than room scent emitters. There was a roof leak by the living room chimney during heavy rain. We pointed this out to the owner during his visit, and hopefully they are to addressed. Enjoyable home and location. Nice outdoor space. The home is nicely renovated and offers great living space. We vacationed here with my family (husband, 2 teenager daughters, and dogs), my parents and my adult brother. Plenty of room for everyone and the beds were comfortable. The dock and deck space is large and the cove is nice for swimming. My only recommendation would be to bring beach/lounge chairs if you like to nap outside or lay in the sun as the outdoor furniture is limited to table and chairs. Great home overall. The house was very comfortable. We stayed with our adult children. Our bedroom was located downstairs, the others were upstairs giving us privacy. The house is clean and comfortable. Very roomy. With 8 adults, we were not crowded at all. We were thrilled when we opened the door and found a very warm and cozy cabin. We shared the home with our adult children who also had a wonderful time. We had the private suite downstairs with a private entrance and bathroom and they had their privacy upstairs. The house looked newly renovated and had every thing that you would need. We played games at the table looking out at the lake, sat at the bar and enjoyed movies and fires in the great stone fireplace. We fished and used the canoe to explore the beautiful clear lake. The spacious dock was also a great place to enjoy a meal or just sit and look out at the lake. We enjoyed all of the local restaurants and tourist attractions. We will have to come back during the summer months so that we can swim. Rates are subject to change. We prefer to rent from Saturday to Saturday during the Summer Rental period due to cleaning schedules. The cleaning fee is included in the rental rate for stays of 3 nights and longer. If a shorter rental period is agreed upon, the cleaning fee of $125 is added to the rate.